Well, the time had come to leave Salento. We took a bus to Pereira then an overnight bus from Pereira to Ipiales at the southern border with Ecuador. We knew we didn’t have much time to spend in Ecuador, so we decided to make our way straight to Baños before we would begin our river journey into the Amazon. The overnight bus arrived in Ipiales at about 10:30 after about a twelve hour ride through the Andes. A long, beautiful ride. 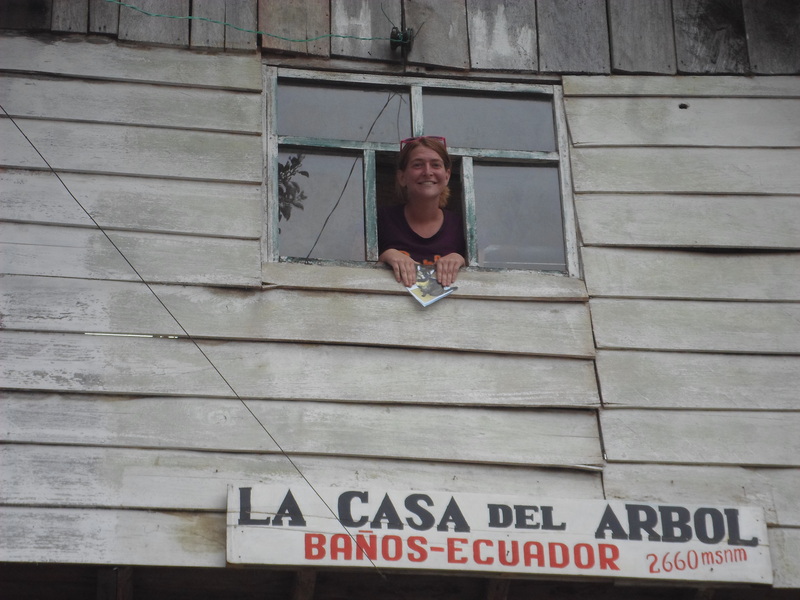 We crossed the border into Ecuador, did border formalities, and took a cab to the closest bus station. From there, we got a $5 bus to Quito that was supposed to be 5 hours. After about 8 hours and a military random bus search, we swirled our way into Quito. Upon entering the bus station, we decided to test our luck and see if we could get to Baños that evening. Perfect timing yet again! The last bus was leaving in ten minutes and we snagged tickets. At about midnight after almost 24 hours on buses, we arrived in Baños. A hotel employee was waiting at the bus station, and we found a spot to sleep for $15 total for a private room. The next morning, we were delighted to see the stunning views that surround this small town. After breakfast (read: instant coffee…sigh…adios Salento), we made our way towards La Casa de Arbol to the swing off the side of a mountain. We began the climb, not really realizing the distance. After about 3 hours of walking, mostly uphill, we had arrived. The walk provided us magnificent views of the snow capped Tungurahua volcano. After catching my breath, I was exhilarated to swing over the side of a mountain. Amazing views and truly special to watch your feet dangle over a cliff. We both took turns swinging and then rewarded ourselves with a beer. We even managed to get a ride down back to Baños with a local family. We spent two more nights in Baños relaxing and enjoying the people and the views. (Replaced my phone too 😉 ) Saturday, we were befriended by a group of locals in a park celebrating a birthday. We ended up spending the entire day with beers and dancing before we boarded a night bus from Baños to Coca. Due to other bookings we had already made, we had three weeks to make it to Iquitos, Peru from Coca, Ecuador. From all the blogs I could get my hands on, this seemed like plenty of time. There is not much information circulating about this trip, but we were excited for a bit of adventure as we entered the Peruvian Amazon. Sunday morning at about 4 am we arrived at the Coca bus station. We befriended a local man, who was all too energized for 4 in morning, and he offered us a ride to the boat port with his wife and brother in law, who happened to be a local tour guide. We located the port and watched the sunrise over the river. The first leg of the boat trip was from Coca to Nueva Rocafuerte for $15 each. We purchased tickets and watched the boat get filled to the brim with all types of cargo, food, people, and tons of children. We probably should have boarded sooner to avoid climbing over all of this with our large bags to our seats at the end of the long, narrow boat. There were probably 50 people on board, not including children. Maybe 15 kids. We settled in to what would be about a 12 hour ride to the last town on the river in Ecuador. We made one stop for lunch (including chicken feet soup…couldn’t do it…) and several other stops along way to unload, and we arrived in Nueva Rocafuerte about 5 pm. Dodgy Boat #1 only got stuck once! Thanks, men! When we got to land, we met Fernando, a traveler from Argentina. The three of us sorted out the few choices for accommodations and decided to split a room. He was also headed to Iquitos and finding travelers to share boats with is always better. That night, we rewarded ourselves with beer, and decided we would find a boat to Pantoja on the Peruvian side of the border as soon as we were able. The next day, we heard word that boats to Pantoja were around $70 for the 2 hour ride. With that info, we thought we would have to wait for other travelers to arrive. After breakfast, a man offered us a ride for $50 and decided we were willing to split that three ways. The boat was about the same size as the first but with only four people on it this time. At about noon, we arrived in Pantoja and did border formalities. We checked into the only hotel for the night (15 soles each). We went for a walk around the small town and enjoyed the magnificent views of the Rio Napo. At one point, we met one of the locals who invited to drink guarapo with him and his family. Guarapo is a fermented yuca traditional drink that has about the same alcohol content as beer. The drink was served in bowls, and to me, it had about the same temperature and consistency as vomit (you’re welcome for that visual). We spent several hours talking to this family and enjoyed learning about life on the river. For dinner, we went to the only “restaurant” in town and had huge plates with fresh juice for S 5 each. We spent the rest of the evening chatting and sipping caña, a cane sugar liquor. Tomorrow we would check to see if there would be a boat to Iquitos. The next day, we awoke to another boat arriving from Nueva Rocafuerte. This brought us 4 more travelers – Nick from England, Stephy from Italy, and Pawel (Poland) and Christina (Germany), a couple living in Ireland. We were now a group of seven heading towards Iquitos. Typically, there is an option from Pantoja to take a 4 day boat to Mazan. When we arrived in Pantoja, we were about a week away from district elections that changed the boat schedule. Seemingly, our only option was to take a large boat leaving in two days for San Rafael, a military base, before it would branch off and head southwest away from Iquitos. From San Rafael, we would need a boat to Santa Clotilde, from there a boat to Mazan, a mototaxi across a small strip of land, and a final boat from there to Iquitos. Well, it was still Tuesday morning, the third day of the trip, and we strung our hammocks up. The boat wouldn’t leave for another two nights so we had nothing to do but wait. The ride would cost S 35 each. Tuesday and Wednesday passed in similar fashions – relaxing in hammocks, eating the same “restaurant” where they had biblical themed telenovelas for us to enjoy while eating, playing with the children. By the time we left Pantoja, 3 of 7 of us had gotten sick (nothing too serious). We prayed for this sunrise. The first break of sunlight was a gift, both in beauty and in warmth! We arrived in Santa Clotilde at about 6 am and began negotiating a boat to Mazan. The going rate was S 80 each for the fast 6 hour ride. We were unwilling to pay that much, so we opted for the slow 12 hour ride for 35 soles each. This boat contained about 40 people with hammocks strung everywhere, 15 children, 2 goats, 2 pigs, a couple chickens, and a pet monkey (farm animals in a pin outside the front of the boat). Our view from the back of the boat. Wow. We were able to clear a space the back the boat and made ourselves as comfortable as possible. It was quite the interesting perspective into living in such a different fashion. 12 hours later we rejoiced we entered Mazan and got off the boat. We stumbled upon a party with live music put on by one of the political parties. We enjoyed dancing and beers and eventually returned the boat to sleep. Early the next morning, we were awoken because the boat would be taking off to Iquitos. This loop around the river takes an extra day in traveling. We opted for a mototaxi across the town (S 3 each) and a final hour boat from there to Iquitos (S 15 each). After 6 days, we made it to the biggest city in world that does not connect to the outside world by road, only boat or plane. This Chiquita and her mother came all the way from Pantoja to Iquitos with our group. What a doll. From what I gathered, this is not the typical route but you never know what’s going to happen. If you are visiting Iquitos, I highly recommend taking the boats in or out. It was not always fun or comfortable, but definitely a treasured cultural experience.